Amazing. That was my honest opinion when I was reading the comments in the AppStore for the first time after actually playing the game. 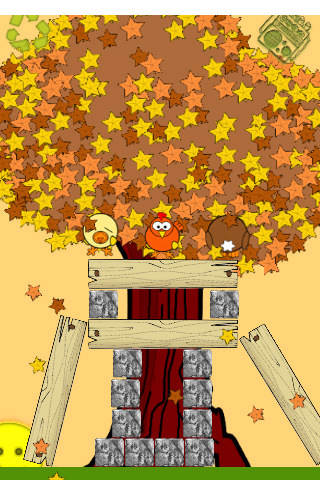 Go Wild Birds is a game where you try to help 3 birds get back to the ground by tapping (and destroying) the platform underneath them. Go Wild Birds might be the first game that I actually thought, “Did they just get a bunch of family members to post this stuff up or did they do it themselves? Go Wild Birds, released by Massimo Croce, is available on the iPhone, iPod touch, and iPad for $0.99. At the time I read the comments, I saw 36 5-star reviews for Go Wild Birds. These aren’t reviews, mind you, they were useless comments along the lines of “Very nice!”, “Very addictive!”, “Very cool game!” and “Very cool app!!!”. Then out of nowhere you get negative comments like “Crashes, very slow to load, not worth the price” and “Nicely done and fun, but only 10 levels too quickly solved. Wouldn’t have bought if I’d known that.” Why do I bring this up? Because my honest experience with this game was dmpened by the thought of fake fans and misleading reviews. The music overall is a country-hick style soundtrack that, though a bit repetitive, it still sets a certain mood for the game. Score one for Go Wild Birds. Gameplay is also functional and the puzzles can be quite challenging. The birds, for whatever reason, cannot fly. 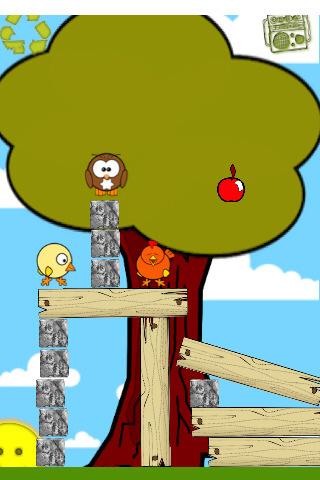 A Bird, an Owl, and a Chicken are standing on wooden planks and rocks and your job is to strategically tap the platform parts to destroy them. Keep in mind that you cannot let the birds fall too far or they will say “ouch” and you will lose the level and that you have to maintain the balance of most of the objects to prevent them from getting hurt. Gameplay is solid and the balancing act is fairly involving, though there are hiccups here and there like the birds suddenly saying “Ouch” randomly from slight movements or minor falls. Graphically, this has got to be one of the worst. The title screen is a mess of sloppily drawn lines, hard to read words, and that chicken image from the App icon. You see that icon? See its feet? Now imagine that smeared mess as text as the very first thing you see when you open the app. The graphics in-game are decent with a noticeable exception of the wood planks. When tapped, the wood splits into a very slow animation of it shattering and splintering. It doesn’t interfere with gameplay, but it is distracting by how oddly unrealistic it is. The rocks shatter into chunks and fall apart, which is expected… but I never saw floating shards of wood coming. Go Wild Birds has 10 levels and they really do go by extremely quickly. This is only slightly extended by whenever the birds randomly fail you for small falls. Each level does have their own background, however simple it is, and on some stages, you get round boulders that roll around instead of acting like bricks, which plays up the challenge a bit. Overall, this is a mighty average game that only barely earns a 4. Even assuming that those comments were earned legitimately, the game is still mediocre at best and requires more work to increase the number of levels and to have the art completely redone, especially the ‘spit-in-my-face-for-buying-this-app’ title screen. I thought I had purchased a 4 year old’s drawing for a dollar. Thanks Go Wild Birds. AppSafari review of Go Wild Birds was written by Joseph Ho on December 11th, 2010 and categorized under App Store, Games, Physics Based, Platformer, Puzzler. Page viewed 3547 times, 3 so far today. Need help on using these apps? Please read the Help Page.